If you liked our Food Pyramid: Nutrition Worksheets for Kids (Grades 1 and 2), you'll certainly enjoy this collection for grades 3 and 4. The U.S. Department of Agriculture (USDA) has developed these lessons to help you teach kids in grades 3 and 4 about healthy food and nutrition. 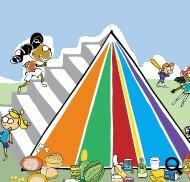 The lessons feature a graphic developed specifically for elementary students titled MyPyramid for Kids (Nutrition Worksheets For Kids). They are designed to integrate nutrition with math, language arts, music, and art. Physical activity is also emphasized. Provide information to send home to parents. Your students will have fun as they learn to eat well and be physically active. 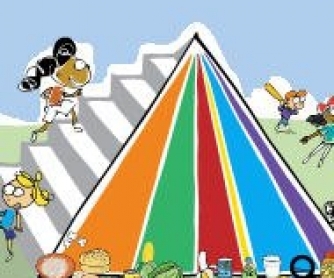 This 16-page collection of nutrition worksheets for kids (The Food Pyramid: Nutrition Worksheets for Kids (Grades 3 and 4) is kindly provided by the US Department of Agriculture, Food and Nutrition Service, and is also available from their website for free download. Detailed teacher's notes are provided for each lesson.